The internationally acclaimed stage sensation, Jersey Boys is returning to Glasgow, this time it’s coming to Glasgow’s Kings Theatre April 2018 ! Jersey Boys, the smash hit musical and internationally acclaimed stage sensation has won 55 major awards worldwide, including the Olivier Award for Best New Musical! This fantastic show is going on tour around the UK and Ireland for the first time and will be stopping in Glasgow’s Theatre Royal in December 2015 & January 2016. Jersey Boys tells the true life story of four boys from the wrong side of the tracks who wrote their own songs, invented their own unique sound, and sold 175 million records worldwide. 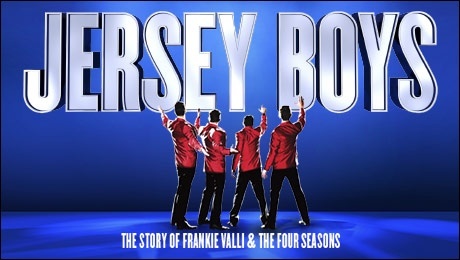 Featuring hit after legendary hit including Beggin’, Can’t Take My Eyes Off You, Oh What a Night, Sherry, Walk Like a Man, Bye Bye Baby, Big Girls Don’t Cry and many more, Jersey Boys is a story full of heart, humour and sheer musical razzmatazz you simply will never forget. Note:Jersey Boys contains authentic New Jersey language. The show may be inappropriate for ages 12 and under due to strong language. I’m not sure what the running time is. You’d be best to contact the theatre directly and check with them. I have a booking for the Jersey Boys in Glasgow. Unfortunately I cannot find any of my booking details. Can you help please? I’m afraid not. You’ll need to contact the Theatre Royal as it’s them you would’ve gotten the tickets from. The website is here http://www.atgtickets.com/ and the phone number is 0844 871 7648. You need to click on the link in the article above to book tickets online, or contact the box office. There’s much more availability in the last week (the week after Christmas) and on Christmas Eve so if you have a look at those dates you should be able to find something.